To start the New Year, Evergreen, Colo., Lodge No. 2363 resolved to inspire kids to love the great outdoors—a resolution the Lodge will surely keep given its track record with successful youth programs. Last year, in conjunction with the Colorado Division of Wildlife, the Lodge used an Elks National Foundation Promise Grant to hold an outdoor skills day for local youth. 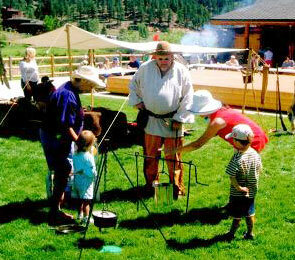 Under a picturesque Colorado sky, Elks led a day of fishing, hiking and outdoor skills demonstrations. From planning the day to running the booths to serving lunch to all 120 kids in attendance, every aspect of this Elks’ event was a resounding success!